Russian teen Andrey Rublev is the youngest US Open quarterfinalist since Andy Roddick in 2001 and on a collision course with his idol — Rafael Nadal. Andrey Rublev returns the ball to Belgium's David Goffin during their US Open fourth-round match at the USTA Billie Jean King National Tennis Center in Flushing Meadows, New York, on September 4, 2017. The Russian teen won 7-5, 7-6 (5), 6-3 . Russian teenager Andrey Rublev tamed ninth seed David Goffin 7-5, 7-6 (5), 6-3 on Monday to become the youngest man to reach the US Open quarterfinals since Andy Roddick in 2001. Although Rublev betrayed his young age with a couple of outbursts, it was nonetheless a mature performance from the 19-year-old as he set up an intriguing last-eight showdown with world No. 1 Rafael Nadal. "Rafa is the real champion and I am going to just try and enjoy it," said Rublev, looking ahead to facing one of his childhood idols. "This is the quarterfinals I have nothing to lose." 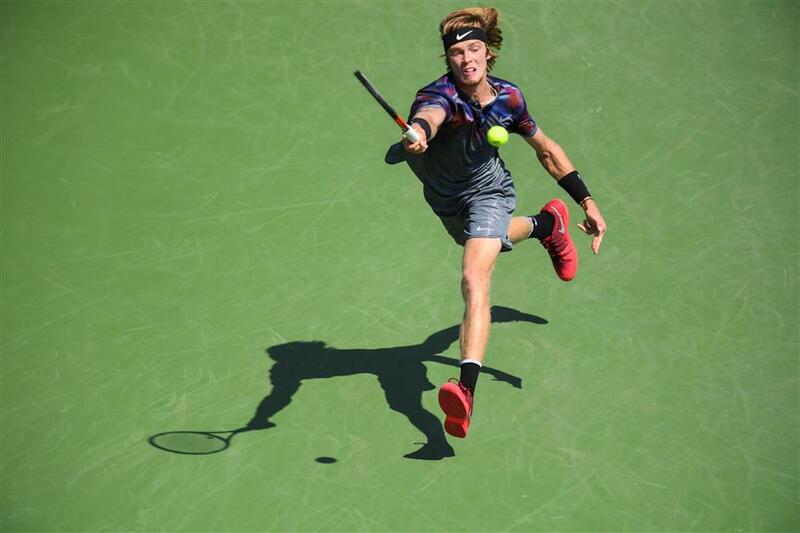 While 18-year-old Canadian Denis Shapovalov was becoming the darling of this year's US Open, playing on Arthur Ashe Stadium to adoring crowds, it is the hardworking Rublev who is the last teenager standing. Facing Goffin for the first time, Rublev broke open a tight opening set, breaking the Belgian at 6-5. A stung Goffin, who has been hampered by a knee injury, immediately broke the Russian twice to open the second on the way to a 3-0 lead, leaving Rublev screaming at himself. That seemed to provide the teenager with a wakeup call as he stormed through the next four games before eventually forcing a tiebreak, won with a blistering cross-court forehand that Goffin could only stare at as it hit the corner. An aggressive Rublev then moved in for the kill, breaking Goffin twice in the third to clinch a spot in the quarterfinals. "I don't know exactly what was happening," said Rublev, whose path to the quarters included a second-round win over seventh seed Grigor Dimitrov of Bulgaria. "I feel he had some problem with the knee then I feel a little bit more relaxed because I know now it just depends on me that if I play good I am going to win this match and this is what happened."